Everyone must be alert to the possibility that children with whom they are in contact may be suffering from abuse or neglect. The Diocese and Diocesan Personnel have a responsibility to pass on child safeguarding concerns without delay (within the next working day) to the Civil Authorities (Tusla and An Gardaí) even in cases where Church Personnel are not directly involved. The safety of the child is paramount. If you have a concern about a child and are not sure what to do, contact the Diocesan Designated Liaison Person. The Child Protection Recording Form 15 should be completed and forwarded to the Diocesan Designated Liaison Person. Reports should be made without delay to the Diocesan Designated Liaison Person, Tusla and An Gardaí. If a child is in immediate danger contact the Gardaí directly. Under The Protection of Persons Reporting Child Abuse Act 1998, so long as you report what you believe is true and it is done in good faith you cannot be sued. Mandated persons are people who have contact with children and families and who because of their role, qualifications, training and/or employment, are in a key position to help protect children from harm. For a full list of those who are classified as mandated persons, please see Schedule 2 of the Children First Act. Safeguarding officer, child protection officer or other person (howsoever described) who is employed for the purpose of performing the child welfare and protection function of religious, sporting, recreational, cultural, educational and other bodies and organisations offering services to children. To assist Tusla, if requested, in assessing a concern which has been the subject of a mandated report. As a mandated person you must report any knowledge, belief or reasonable suspicion that a child has been harmed to TUSLA and to An Garda Síochána from 11th December 2017 onwards. Allegations relating to Church personnel (clerics, religious, employees and volunteers) will continue to be processed through the DLP, when a joint report will be made with you as the person who has received the allegation. Allegations relating to matters outside the Church will need to be processed solely by you; however you can consult with Tusla and/or the DLP to ensure the concern meets the threshold for reporting. Information relating to the concern must be passed to the Diocesan Designated Liaison Person without delay. See contact numbers below. 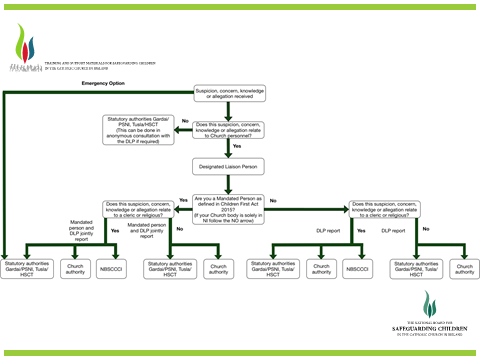 If the concern is external to the Diocese, the Designated Liaison Person will pass the concern to the Civil Authorities (See Fig.1 Reporting Flow Chart). If the concern is internal, the Designated Liaison Person will ascertain if the grounds for concern are reasonable. (See Fig.2 Reporting Flow Chart). If the concern is reasonable a case file is opened by the Designated Liaison Person and the concern is passed to the Bishop and Civil Authorities without delay (next working day). The Designated Liaison Person will update the person raising the concern (within a reasonable timeframe) on whether the concern has been forwarded or not to the Civil Authorities. If the person raising the concern is unhappy with the Designated Liaison Person’s response they should be encouraged to go to the Civil Authorities directly. In all cases the person raising the concern should be encouraged to report their concern to the Civil Authorities. If you are unsure about any aspect of a safeguarding concern you are encouraged to contact the Designated Liaison Person or Director of Safeguarding directly for advice and support. An Garda Síochána launched a dedicated phone line for the reporting of child sexual abuse on the 2/3/17. The phone line number is 1800 555 222. This confidential Freephone line will be manned on a 24 hour basis, 7 days a week, 365 days a year. This is a Freephone number meaning that there will be no cost to callers from calling this number. An Garda Síochána encourages victims of child sexual abuse to report any such incident at the earliest opportunity including those incidents of an historical nature.